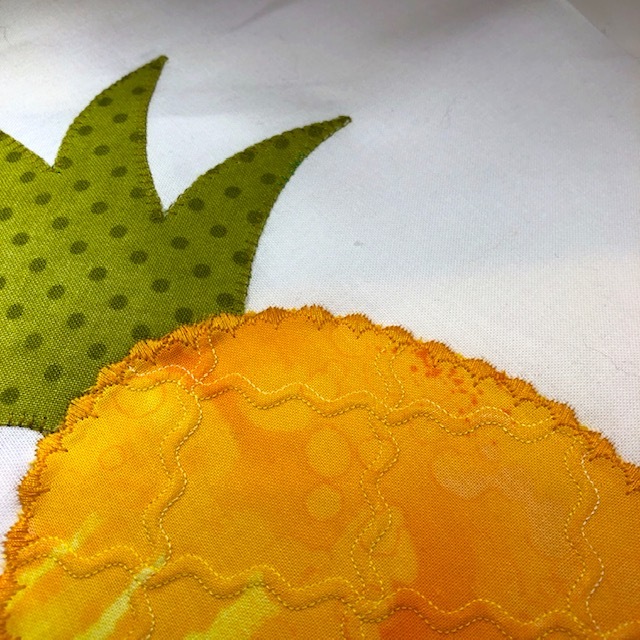 In my last blog post, I shared a nifty technique for adding texture to your fabrics for a pretty pineapple block. 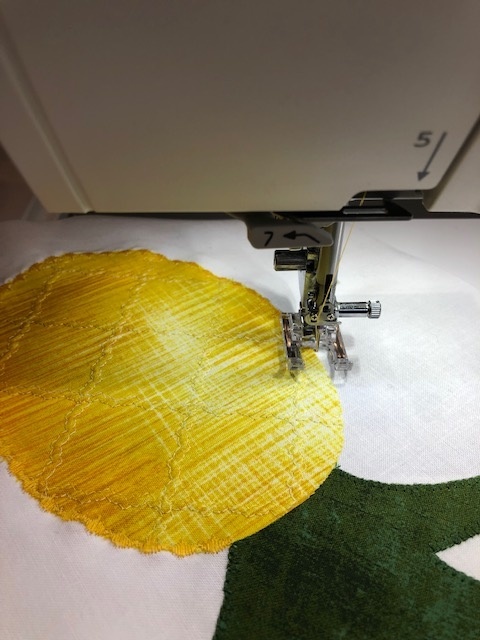 In this post, I’m going to share some fun and fabulous options for an interesting way to machine applique your pineapple blocks. In case you missed Part 1 of this two-part series, simply CLICK HERE. This method is for fusible machine applique. 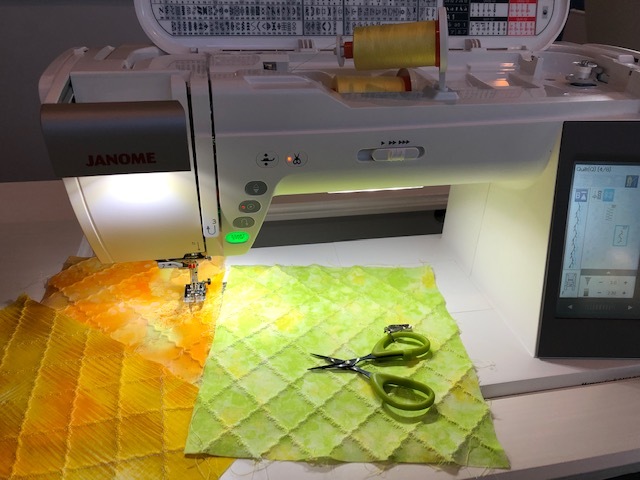 I have been enjoying fusible machine applique recently and have learned a lot about the importance of quality products and materials when it comes to the fusible web you use. Check out my blog post HERE where I discuss this in depth. 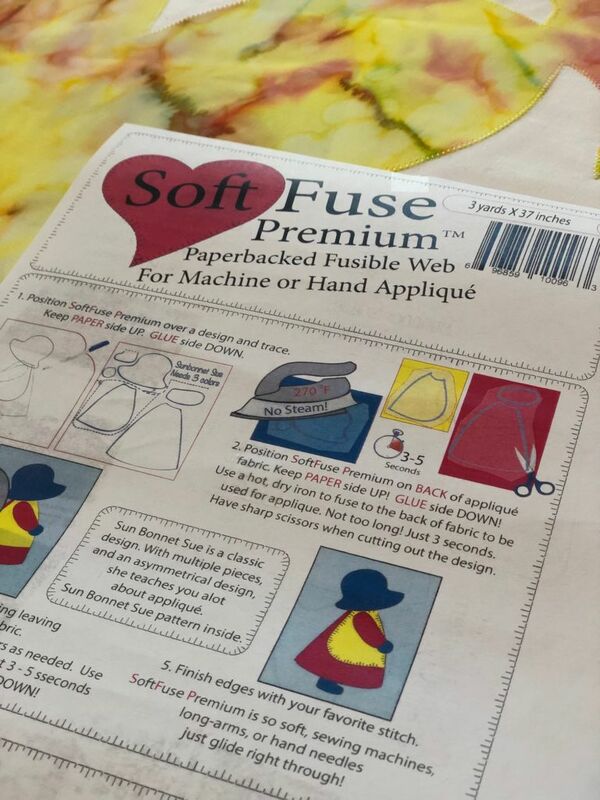 Incidentally, I use Soft Fuse fusible web and I love it! If you haven’t already downloaded the pineapple shape, you can do so now. Once you have traced the image to the paper side of your fusible web, fuse it to the wrong side of your textured fabric and cut out the shape on the drawn line. As for your block background fabric, I highly recommend starching the fabric to give it a crisp, stiff finish prior to fusing the shape. Carefully follow the manufacturer’s directions to fuse the shape(s) to the background fabric and allow to cool thoroughly. Now you’re ready to machine applique! Of course, my fabulous Janome Horizon Memory Craft 9450 QCP is Cheeto approved! 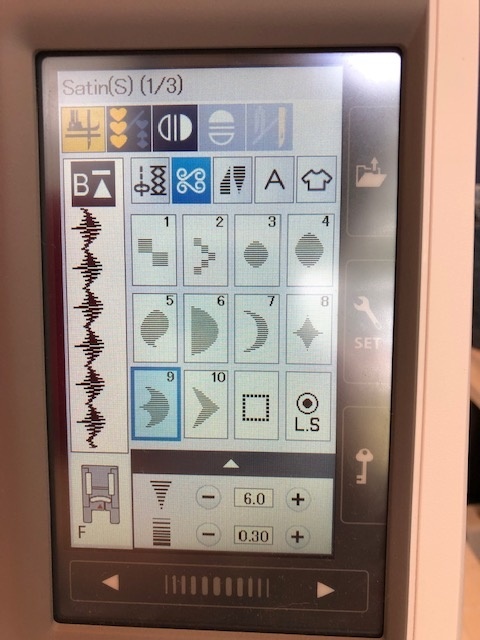 I used my 9450 and I’d like to share the stitch I used to do the machine applique. If you don’t have this machine, I invite you to run to your local Janome dealer and see for yourself all the reasons why I love this particular model so much. But even if you don’t, you may have a similar-style satin stitch on your model or brand of sewing machine. 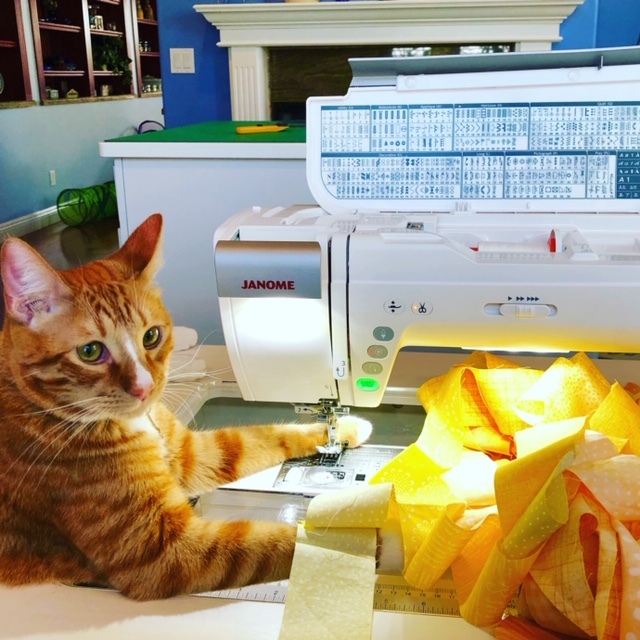 This may be an area of your sewing machine’s capabilities which is rarely visited or used and if this is the case, I’m excited for you to give it a try! 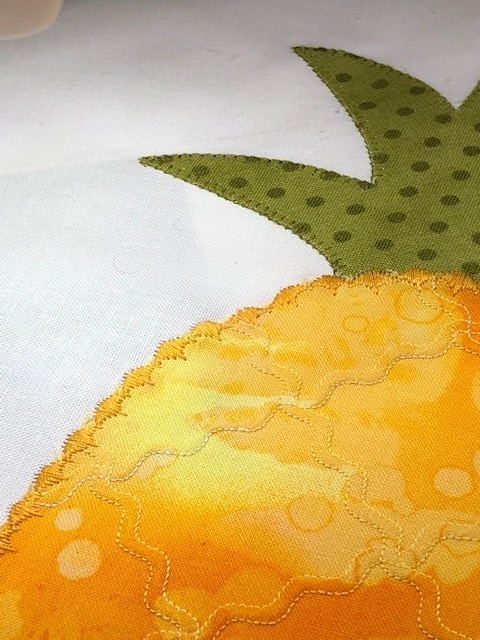 I browsed the many satin stitch options and found the one I thought would make a pretty, decorative finish to the applique edges of the pineapple. 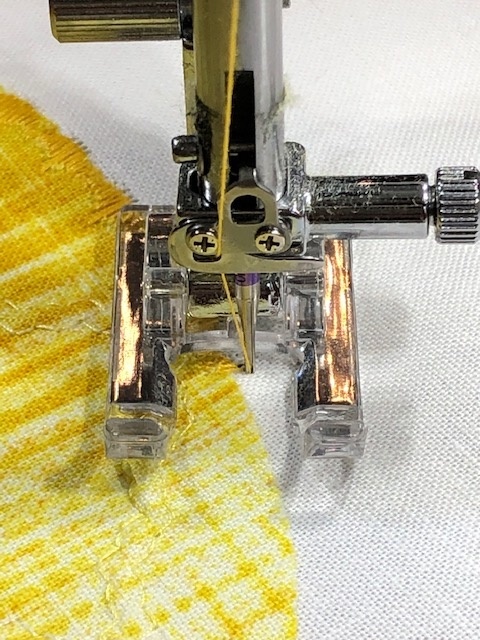 Once you have selected the stitch, chosen the appropriate thread color to match or highlight the applique, attach an applique presser foot to your machine (I prefer an open-toe presser foot) and be sure to do some test stitching on sample fabric prior to stitching on your actual block. Once you’ve found the settings you like best, you’re ready to stitch your applique block. Just look how beautiful the satin stitching looks on the finished appliqued edge of the gold fabric! I hope you’ll give this a try and experiment with different types of satin stitches for your machine applique. Would you like to see my finished pineapple applique blocks? I’ve finished my Pineapple quilt and it is now in the process of being quilted by my good friend, Carolyn Archer of Ohio Star Quilting. 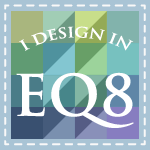 I hope to have the finished quilt back in a few weeks at which time I’ll share it with you here. Be sure to keep an eye open for the upcoming post! In the meantime, please leave a comment or share a photo of your pineapples here and let me know what you think of this idea. I’ll look forward to hearing from YOU! 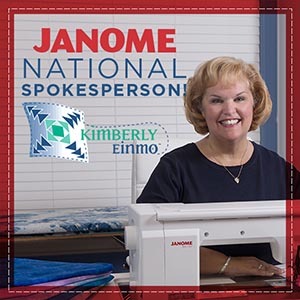 Hi, Kimberley, my name is Tami Alexander and I’m the VP of the Raincross Quilt Guild and a customer of Moore’s where I bought my beloved Janome. 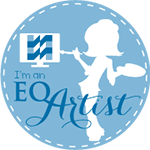 The reason for my inquiry is we are seeking a guild speaker (and possibly class instructor) for our May 2019 Guild Meeting. We have 107 members (and growing) and meet the third Tuesday of the month. 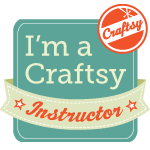 Typically we hold our classes on Saturday depending on size, project and location. Could you give me a call at (951) 522-9653 to discuss opportunity, fee, and logistics? I love that stitch Kimberly! I use it a lot for edging, and when it’s small like that, it covers every bit of any “fluffy” edging on the fabric. It also makes the perfect lace edge when you’re stitch building around an embroidery design. Two or three rows of decorative stitching with this little stitch on each side (one mirrored) and it looks just like lace. Fabulous idea, Mary! Because I think the look of lace would be incredible. I’ll have to give that a try! Thank you for sharing! I love that stitch and would not have thought of using it in that manner but will on a future project. That sure makes me happy, Evelyn! Thank you! Thanks for sharing that stitch. Will look for new stitch for edge stitching. You’re most welcome, Judy. So glad you like it!